It's the little things in life...: "Earthquake Game"
Everyone—especially SEC fans—are familiar with LSU’s infamous “Earthquake Game” vs. Auburn in Death Valley circa the late 1980s. Well, there is now a second game. 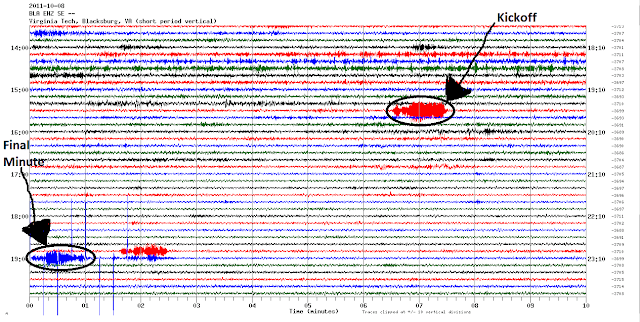 The seismograph readings from the VT Geophysics Observatory on Airport Road (for those of you familar with Blacksburg) actually measured an earthquake on three instances during the VT-Miami game on Sat.